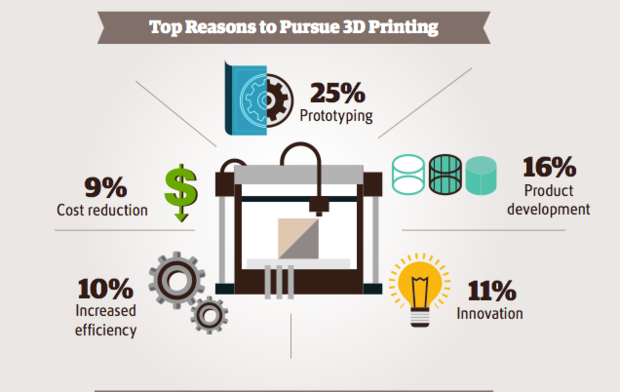 98% of hearing aids worldwide are manufactured using 3D printing. The 3D printing market, which has grown by as much as 30% year-over-year in the past, is now set to triple in revenue over the next four years, according to a new report. 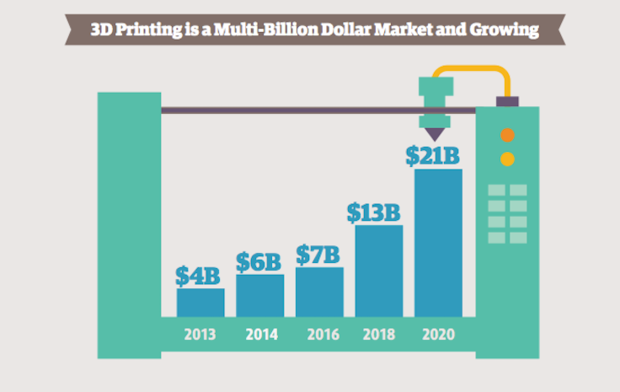 This year, the 3D printing industry, which includes machines, materials and printing services, will reach $7.3 billion. By 2020, it is expected to grow to $21 billion, the report said. The new study is called "3D Printing: The Next Revolution in Industrial Manufacturing." Published by the Consumer Technology Association (CTA) and the United Parcel Service (UPS), the report revealed that the consumer electronics and automotive industries will represent a combined 40% of the coming growth in 3D printing, followed by medical devices with 15%. For example, 98% of hearing aids worldwide are manufactured using 3D printing. Many hearing aids are created using stereolithography 3D printing, like these ear pieces from Danish company Widex. The bulk of 3D revenues are coming from western countries (such as those in North America and Europe), which account for more than two-thirds (68%) of the 3D printing market revenue. Meanwhile, the Asia Pacific market accounts for 27% of sales. The study compiled information from published research, such as the 2015 "Wohlers Report," and forecasts from industry pundits and analysts, in an attempt to gain insights into the factors that will influence the continued adoption of 3D printing. Two thirds of manufacturers already use 3D printing in some way, and 25% plan to adopt the technology in the future, the report stated. 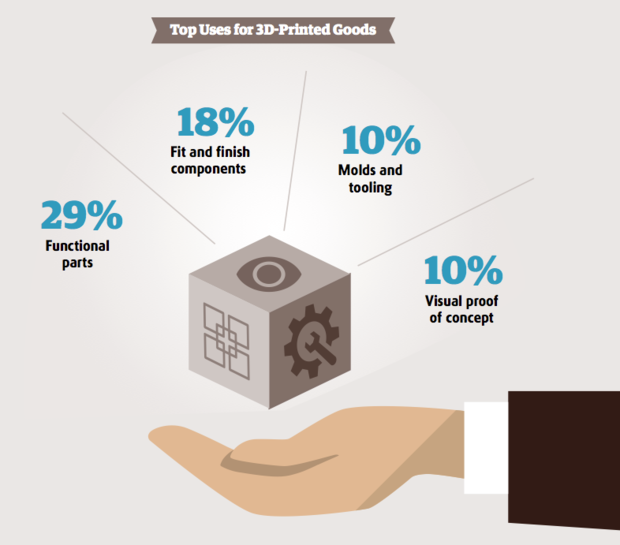 The top reasons corporations cited for pursuing 3D printing are: prototyping (25%), product development (16%) and innovation (11%). Early-adopter industries have used 3D printing technology primarily during the prototyping stage of production. In fact, 3D printing represents only 0.04% of the global manufacturing market, with prototyping as the leading use today. Research firm Wohlers Associates believes 3D printing will eventually capture 5% of global manufacturing capacity, which would make 3D printing a $640 billion industry. "This is a market ripe for disruption," the report said. "Technology adopters that move beyond prototyping to use 3D printing in supporting and streamlining production can achieve new manufacturing efficiencies. Plus, there is an enormous opportunity for companies that get it right." Smartphone manufacturers, for example, are slowly starting to use 3D printing for more than just prototyping; some component parts are now manufactured with 3D methods. While the primary market for 3D printing -- which includes 3D printing systems, materials, supplies and service -- grew at least 30% each year from 2012 to 2014, the rest of the growth comes from the secondary market, including tooling, molding and castings. For example, Ford has five 3D prototyping centers that churn out tens of thousands of prototype parts each year. In all, Ford makes use of a half dozen types of 3D printing methods, including stereo lithography, selective laser sintering, fused deposition modeling and a lesser-known process known as binder jet printing, where layer after layer of sand are epoxied together to create injection molds for metal parts. 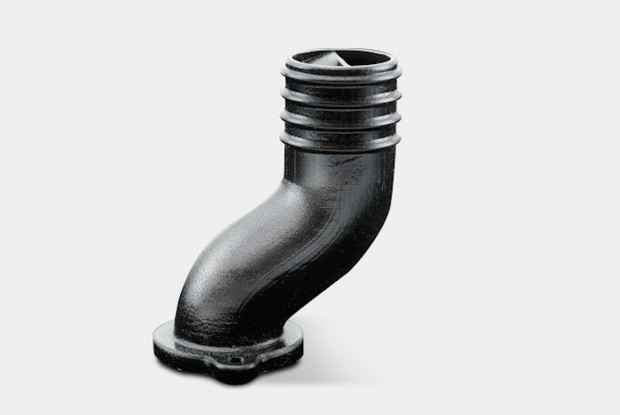 A pipe printed using a Continuous Liquid Interface Production (CLIP) 3D printing process. CLIP 3D printers can create objects in minutes compared to the hours a typical 3D printer requires. 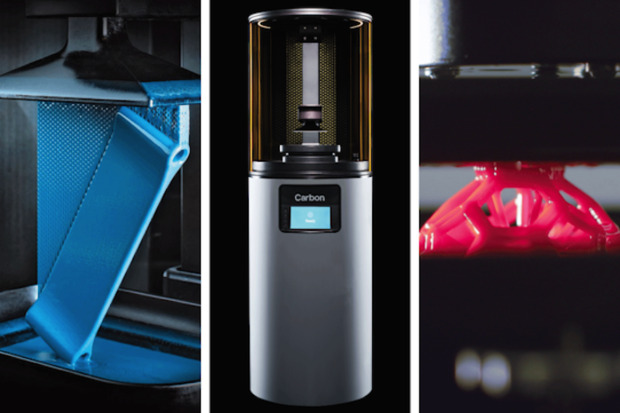 The CLIP 3D printer, from Carbon Inc., is called the M1 and it can print production-ready parts that can achieve price parity with traditional manufacturing methods, with runs of up to 45,000 units. Despite a large number of manufacturers already using the technology, the full potential of 3D printing is far from tapped, the report said, and much of the opportunity lies in parts production -- the fastest-growing 3D printing application. The use of 3D printing for parts production grew from virtually zero in 2003 to 43% ($1.8 billion) of global 3D-printed product and service revenue in 2014. Thirty-two percent of current users don't believe their company is fully leveraging the advantages of 3D printing while 45% of intenders would use the technology more if benefits were better understood by their company, according to the report. 3D printing can speed development and delivery for customized products and bring increased flexibility through better inventory management and real-time production of wares that have variable demand. Other advantages named in the report: Manufacturing advantages for small batches, cost advantages based on efficiencies for certain applications and unprecedented flexibility in new markets. 3D printing also can improve quality through lighter parts, better ergonomics and more design freedom. However, inconsistencies in product manufacturing processes using 3D printing can impact product durability, according to the report. "It's critical to consider needs and priorities to make the decision between 3D printing and traditional manufacturing. Like everything else, there are benefits and trade-offs," the report stated.